United Mongols is a nation led by ANNOY MOOSE Joe Coolmon on the continent of Australia. United Mongols's government is a Absolute Monarchy with very conservative social policies. Economically, United Mongols favors moderate policies. The official currency of United Mongols is the Dong. At 365 days old, United Mongols is an ancient nation. 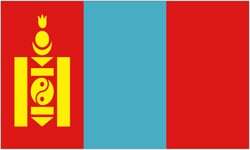 United Mongols has a population of 2,636,768 and a land area of 24,500.00 sq. miles. This gives it a national average population density of 107.62. Pollution in the nation is almost non-existent. The citizens' faith in the government is completely depleted with an approval rating of 0%. After fleeing Asia due to the defeat of the Mongols, they flee to Austrailia in hopes of one day reconquering Asia.